Since our dog, Blue Belle, is a medium sized dog and not a Chihuahua we recognize that we don’t know much about how to take care of a small puppy. Thanks to this post from Sara, we have learned about the needs of a Chuhuahua puppy. Sara tells us before you go shopping for toys for Chihuahuas, check out this easy guide. You’ll learn everything you need to know about what your Chi needs in a toy. We all want to give our dogs the best food, treats and toys that money can buy. But sometimes we’re not sure where to start. You might find yourself confused about what the right toys are when you’re a new dog owner. This applies for every breed but in this case, we’re talking about Chihuahuas. As a parent to a brand new Chihuahua puppy, you want to start spoiling them right away. You want to get the best toys for them so that they can meet all their chewing needs. But don’t go shopping for toys for your Chihuahua before you learn about the best toys for them. They’re little dogs but as puppies they can chew like any other breed. 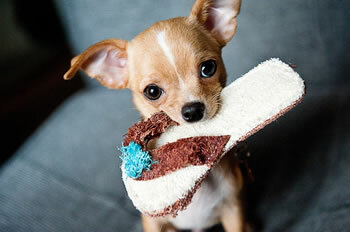 Here you will find everything you need to know before buying toys for Chihuahuas. All your Chihuahua’s needs and what qualities to look for in a toy are right here. Chihuahua puppies love to chew but they aren’t the only ones. Even adult Chihuahuas enjoy chewing. Chi puppies start teething at around the age of 4 months. The reason for their need to chew is because they’re gums are itchy. They’re gums itch because they’re baby teeth are getting lose and their adult teeth are coming in. It’s so important to have adequate toys for your Chi pup to chew on to relieve their discomfort. If you don’t provide good toys for them they’ll turn to chewing everything else in sight. This includes furniture, shoes and anything else they can get their paws on.